Everyone makes a big deal of turning 40 and I have steadfastly maintained over the years that age is what you make of it. So, now that I'm officially forty, here are some thoughts on the day to see if I am true to my word. First, I realize that my life with Lynda equals exactly one-half of my total lifetime. And friends, let me tell you that this is a very good thing. No other choice that I could have made in life has been a better one for me or has generated so many good things and guaranteed good things yet to be. If I never do anything else right forever, I can at least point to that twenty-year-old choice and be secure in the knowledge that it was unequivocally the right one. We celebrated on Sunday by going out to dinner at a local Mexican restaurant. This allowed me to enjoy some nice mole sauce on my enchiladas and to get a ridiculous margarita (but a. made out of lime, b. not frozen, and c. not fruited up . . . because I'm still a man, you see). As I'm eating the meal, Grace (on one side of me) is trying to get Sarah's approval (on the other side of me) to deliver something. 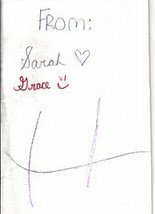 Now, I know that it is probably a birthday card that I had heard was in the works, but I'm being the good, clueless dad and not acknowledging the events for Grace's sake. Halfway through the enchiladas (and two-thirds of the way through the ridiculous margarita), they present me with this wonderful card which I reproduce and interpret below. 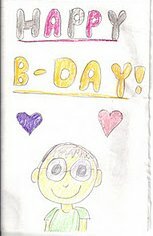 This is the front of the card, which obviously says "Happy B-Day!" For some reason, they chose not to include my excellent winter beard in the image rendition. Perhaps they don't like the way it scratches their faces? Here is the important, special part of the card. On the left is me, regal in my provided birthday crown. "Dear Dad: We love you so much. I hope your having a fun time on your birthday. You are awesome. You are the best Dad in the world. You are really silly. Dad, we love you at all times. I'm happy that you never give up on us. 5. Your like a friend. And on the last page, they apply their signatures. Hannah's is the big "H."
(Whenever she sees an H anywhere, she always says . . . That's Me. That's an H for Hannah. Now, I ask you . . . how could any meaningless construction of a decade-based birthday possibly overshadow such love and wonder?